Ruth Hawkinson Perkins in the Twin City Marathon, where she qualified for the Olympic trials. She remembered going into shock after crossing the finish line in one marathon. She remembered winding up in the emergency room after collapsing in another one. No wonder Ruth Perkins was ready to forget about anything to do with 26.2 miles. Perkins was ready to get her distance-running high at lower distance. What she wasn't ready for was to see that marathon door suddenly open again – and leading to a path that stretches all the way to Houston for the 2012 United States Olympic Trials. Perkins will test her marathon mettle against the rest of America's premier female runners next Jan. 14. “A friend talked me into doing the Tacoma City Marathon (in 2010) – that was going to be the last marathon of my life,” said the 30-year-old Perkins. “My goal was to run under three hours. I totally surprised myself and ran a 2:50:49. The standard is 2 hours, 46 minutes – most definitely within reach for someone of Perkins' ability and training base. “The thought that I had trained for that without a coach, I was running literally by myself (she was the third finisher overall), and I ran 2:50,” Perkins said. Then in 2010, Perkins signed up for the Fort Steilacoom Running Club Series, a group of winter races that starts at five miles (or five kilometers), then moves up to 10 miles (or 10K), 15 miles (or 15K) and finally, 20 miles (or 20K). She signed up for miles – and won the series. Built up enough to try another marathon? She didn't think so. “My friend said, 'You can't do that kind of series with that kind of pace and not top it off with a marathon. '” Perkins said. So she topped it off with the Tacoma event, where she figured to cross her final marathon finish line – only to discover that it was really just another starting line. In spite of the completely-on-her-own accomplishment in Tacoma, Perkins, who works as a personal trainer, knew she needed some coaching help to elevate her performance. She contacted Tom Cotner of Club Northwest, and they clicked immediately. “I've actually only done two workouts in front of him. He has done all of this coaching for me through email and phone calls,” Perkins said. A bit out of the ordinary – but it's working. Cotner suggested she enter the Twin Cities Marathon to go for the U.S. Trials qualifying mark. Nothing crazy about it. So after handling an initial curveball when she arrived (Perkins thought Cotner had registered her for the race; Cotner thought she had registered herself – neither of which actually happened), she stepped to the line last Oct. 3 on a cool, crisp Minneapolis morning. That "team" doubled in size to four as the race went along. By the finish, all four had beaten the 2:46 standard for the U.S. trials, with Perkins crossing the line in 2:43:18 – more than seven minutes faster than in Tacoma. Cotner had every expectation that Perkins would run as well as she did on that day. “We have a lot of (coaching) experience, and we have a way of training people who want to get there and who are motivated,” he said. Perkins isn't planning on another marathon until Houston. But she is hardly just sitting around. June 26, Perkins won the Scotia Bank Half Marathon in Vancouver, B.C., posting a personal-best time of 1:16:14. 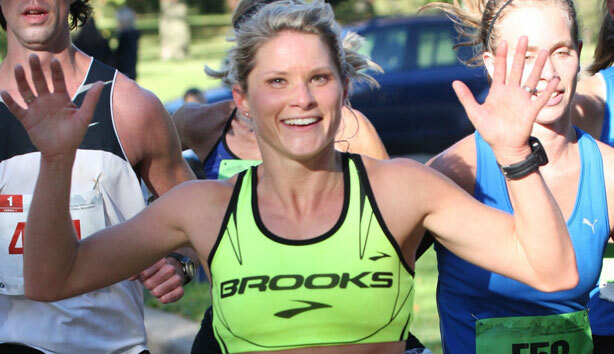 As a Blue Streak athlete for Brooks Running (one of her sponsors), she has competed this year in the U.S. Half Marathon Championships (placing 26th), and the U.S. 25K Championships (finishing 12th). In September, she plans to do the Labor Day Half Marathon in Woodinville. “Once I accomplish that,” Perkins said, “that will get my marathon training cycle started again. I'm feeling confident and excited about it. My family is very supportive, and my husband and kids are incredible." For Ruth Perkins, it's a long way from that Tacoma marathon in 2010, which she figured she would run – and then be done. “That experience pushed me out there,” she said. This article was reposted with permission of Falcon Athletics. Information about the 2012 Olympic marathon trials.